What is the smallest possible distance between plated through holes? A. The holes are a part of different electrical nets? Plated through holes that belong to a different electrical net, need at least 0.25mm base material between their hole walls. To calculate this, you will need to count with the manufacturing tool size which is 0.10mm larger than the end diameter. A 1.00mm PTH finished hole size, is drilled with a 1.10mm tool. So to leave 0.25mm of base material between two holes of 1.00mm their centre coordinates need to be 1.35mm apart. Or in other words: two PTH holes from a different electrical net need to be 0.35mm from each other, measured on the finished holes size (end diameter). Why do we need this distance? Smaller than 0.25mm drill to drill distances will create micro cracks along the glass fibre walls. The chemicals used in the galvanic line can intrude these cracks and create small shorts between the hole walls. The resistance of these shorts is typically larger than 1 MOhm. Why could we use a smaller distance in the past? In the past (before 2006) the distance could be smaller because we used only base material for leaded PCB technology. The materials for lead-free PCB technology are more brittle and thus more sensitive to cracks and moisture intrusion. B. The holes are a part of the same electrical net? 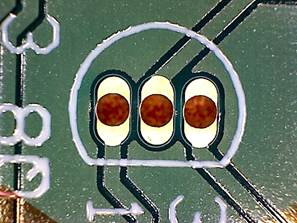 When the plated through holes are part of the same electrical net, the PCB designer may decide that the possible shorts described under point A above are not causing any problems. In that case we are able to produce these neighbouring PTH holes with a distance drill to drill of 0.15mm. Or in other words: 0.25mm between the finished holes size diameters. If the distance between the hole walls becomes smaller than 0.15 mm than this will result in bad drilling causing the base material to be damaged en drill bits to be broken. It results into an avoidable cost increase. What is the smallest possible distance between non-plated through holes? Between the non-plated through holes we also have to keep a 0.15 mm drill to drill distance. For NPTH holes the tool diameter is equal to the end size diameter Or in other words: we need 0.15mm between the finished holes size diameters. The reason was explained under point B. above. If the distance between the hole walls becomes smaller than 0.15 mm than this will result in bad drilling causing the base material to be damaged en drill bits to be broken. It results into an avoidable cost increase.